The penultimate Wasatch Citizen Series was run on the 11th of February, and again we had a stellar turnout and some fantastic racing was had by all! Andy Dorais, Greg of Gear:30, and myself arrived at Brighton at 4 to start setting course with light snow falling, and put together a nice course along Elk ridge above Snake Creek lift. As the crowd continued to grow before the start I gave my attempt at describing the course, which elucidated confused looks from nearly everyone before Andy Dorais stepped in and translated my attempt into something understandable. The start was fast as always, with a long flat skin across the snake creek flats to the bottom of Golden Needle for the start of the first major climb. The front pack had sorted itself out by this point, with Gemma Ribot absolutely flying! At the top of the first climb, Gemma showed us all what she is capable of and lead the way into the first descent. For the rest of the race it was Gemma in the lead at the top. The race group completed two laps, which each lap being three climbs and descents and a gain of ~1300 feet, while heavy metal battled it out over one lap. In the end Gemma took both the womens and OVERALL win for the night! Eric Bunce came in a close second to take the mens win and a nice rhubarb pie. It was great to spend some time on the course during the race and see everyone out having a great time. One memorable moment came as I was starting to pull flags and found a pair of skis and one (1) skin at the first transition. Thinking the owner had stopped to use the facilities I searched around but could not find them. I then saw him running down the first descent, skin in hand, which had been left at the first transition…extra points for keeping up the race mentality! 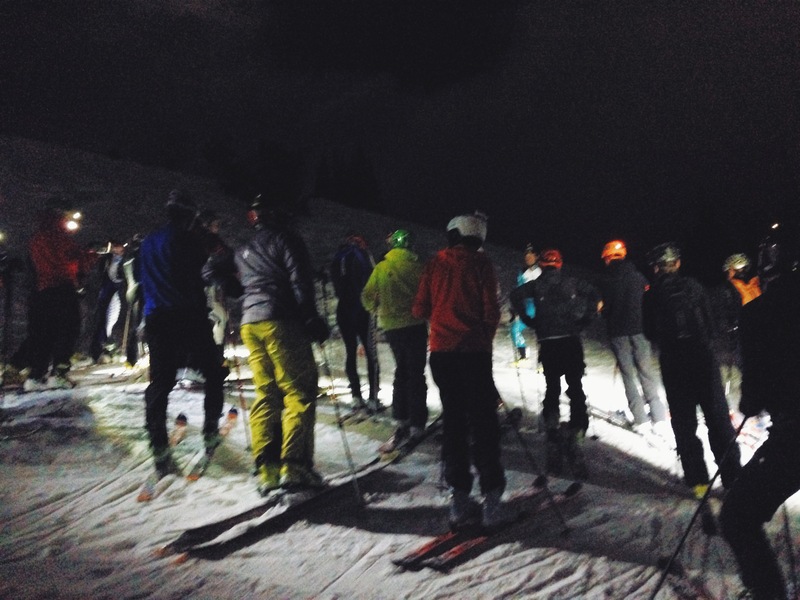 As I cleaned the course the clouds parted and I was treated to an amazing ski under the light of the moon and stars back to Molly Greens for the awards, raffle, and the party! Gemma left with a pie, and a new pair of Scarpa ski boots generously donated by Backcountry.com, who also brought a pirate’s booty of raffle items. It seemed that everyone at Molly Greens left with something (even the bartender), except Eric Bunce, who kindly declined to take the womens size small T-shirt to all of our benefit! As always, our wonderful sponsors (Powderwhore films, Gear:30, Backcountry.com, The Sport Loft, Skimo.co, Momentum Climbing Gyms, CAMP USA) were on hand and donated some amazing prizes for the raffle. Thanks to all who attended, and look for the last race of the season at Brighton Resort on February 25th!